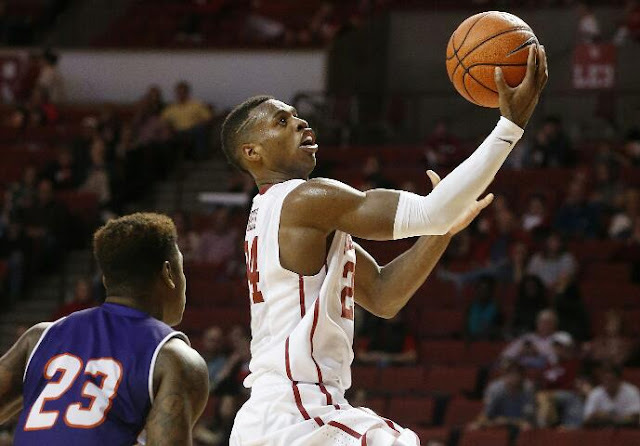 Oklahoma senior guard Buddy Hield, a leading candidate to win the U.S. Basketball Writers Association's Oscar Robertson Trophy for national player of the year, headlines the 2015-16 USBWA Men's All-America Team. Hield, who was earlier named District Player of the Year by the USBWA in District VI, is the 14th Sooner in history to earn first-team All-America honors and the first since Blake Griffin (2009). A 6-4 guard from Freeport, Bahamas, Hield has been among the nation's scoring leaders all year, finishing the regular season leading all Power 5 conference players with his 25.1 points per game. Hield, who has scored at least 30 points in 10 games this season (tied for most in the nation), currently ranks first in the country in both 3-point field goals made per game (4.0) and total 3-pointers made (127) and fourth in 3-point field goal percentage (.464). He ranks fourth all-time in career scoring in both OU and Big 12 history (2,165 points). Hield is joined on the USBWA's All-America first team by Malcolm Brogdon of Virginia, Brice Johnson of North Carolina, Ben Simmons of LSU and Denzel Valentine of Michigan State. The first team boasts four seniors, in addition to Simmons, a freshman. The last time as many as four seniors appeared on a USBWA All-America First Team was the 2005-06 season. Named to the USBWA's second team are Kris Dunn of Providence; Georges Niang of Iowa State; Jakob Poeltl of Utah; Tyler Ulis of Kentucky; and Jarrod Uthoff of Iowa. The USBWA All-America teams are voted on by members of the USBWA, which is comprised of over 900 sportswriters and sports journalists who cover college basketball for newspapers, magazines and websites. The USBWA will announce its Oscar Robertson Trophy winner as the national player of the year at the NCAA Men's Final Four in Houston at a press conference on Friday, April 1. The Oscar Robertson Trophy will officially be presented to the player of the year at the College Basketball Awards gala and dinner in Oklahoma City on Monday, April 11. The trophy is named after the legendary "Big O," a three-time national player of the year and All-American at the University of Cincinnati.